Huge thanks to http://www.beercrank.ca for permission to use this SWEET picture. Beau’s keeps sending new beers out our way and I’m happy about that. While I am mostly focused on what’s happening here locally, and what beers we can get from our local folks, I do enjoy reviewing these beers from Beau’s. Luckily, this beer is both! It’s a beer brewed in collaboration with Half-Pints Brewing Co. as part of the nationwide collaboration brews Beau’s is doing for Canada’s 150th. The Killer Kvass from Beaus is starting to pop up on shelves in Liquor Marts and beer vendors around the city. So now is the perfect time for a writeup of this beer. The Kvass has been a common drink in Europe since the middle-ages. It is comparable with other grain based fermented beverages, like beer, but was invented by the Slavs and became a popular drink among this group. The word “kvass” first appears in 996 C.E. following the Christianization of the Kievan Rus. The first mention of Kvass in an English text wasn’t until 1553. In Russia, under Peter the Great, it was the most common non-alcoholic drink in every class of society. In Russia, the Kvass has been touted as a more “patriotic” alternative to drinks like Coke or Pepsi. A Kvass is a style that I had never heard of before Beau’s and Half-Pints announced they’d be brewing one. A Kvass is a traditional Slavic beverage that is typically made using Rye Bread. The colour of the chosen bread will affect on the colour of the beer. Much like other fermented beverages like Kombucha, a traditional Kvass is classified as non-alcoholic typically having between 0.5%-1% alcohol content. In many instances, the Kvass is flavoured with fruit or herbs. This Kvass is a “Killer” Kvass. The folks at Beau’s and Half-Pints have amped it up and produced a whopping 2.5% alcohol. This Kvass was brewed using 70kg of organic rye bread croutons, organic lemon peel and organic raisins. A portion of the sales of this beer will go towards supporting D’Arcy’s Arc in Winnipeg. For that reason alone, I encourage you to give it a try. Beau’s did a really great video introduction of this beer with Chris from Half-Pints. I’d recommend checking that out if you haven’t seen it already. You can view it here. Appearance – Pours a hazy golden colour with a nice amount of head that dissipates quickly leaving on a little bit of foam. Smell – A nice bready aroma combined with some herbal notes and a hint of citrus. You can certainly tell it was made using rye bread as this comes through on the nose. Taste – A lot lighter than I had expected but with a good amount of flavour. The rye bread notes come through along with a noticeable yeasty character. There is a nice raisin sweetness and that subtle lemon citrus just at the end. Mouth Feel – Light bodied, clean drinking, good finish and rather refreshing. Overall Thoughts – Having never had this drink before, I was rather impressed with it. It is an easy drinking beer that brings a nice punch of flavour for only 2.5%. Do I like it? – I did enjoy this beer. I found that it brought a lot to the table for being only 2.5%. As someone who enjoys drinking Kombucha, a Kvass might be right up my alley. It’s a great time of year around my place. We are getting ready for the holiday season to begin, our daughter is starting to grow, and it is almost time for me to crack into the craft beer advent calendar. I’m hoping folks will enjoy reading about each one of the beers and breweries as much as I enjoying learning about them. Today I am starting a series that I hope to continue for as long as I am able. “Get to know a brewer” is something I thought of when I was last chatting with Jeremy Grisim from Half Pints. When I first met Jeremy, he was doing me a favour and picking me up a test batch from Half Pints. Over time, I started seeing him at Half Pints more often and later learned he had joined the Half Pints team. Now, he’s accomplished a goal he set for himself of becoming a brewer. So, who better to start this with than him. Jeremy became interested in brewing while he was working on a chemistry degree. He had taken some biology and chemistry courses that talked about fermentation sciences and as he had tried various craft beer and was being exposed to new styles of beer, Jeremy decided to try home brewing. He started small, buying a kit from Grape and Grain, and from that point he was hooked. While he had initially thought of being a chemistry teacher, he felt a calling to one day open a brewery and decided that he would follow that dream and work towards it. Having a good background in science, Jeremy felt as though he needed to get some more knowledge surrounding the brewing process and the science/art of brewing beer. He took the executive overview of brewing from the Siebel institute and began communicating with as many brewers as he could across Canada seeking their advice and direction on further education. From this advice, Jeremy decided to do the 1-year associate degree in brewing technology from the Siebel institute. While this provides some great learning, it lacks in practical experience. Really wanting to get this practical knowledge, Jeremy and his wife had been ready to move their family wherever they needed to go. Luckily, he was hired on at Half Pints as a brewery assistant in May 2015 and began chasing his dream. 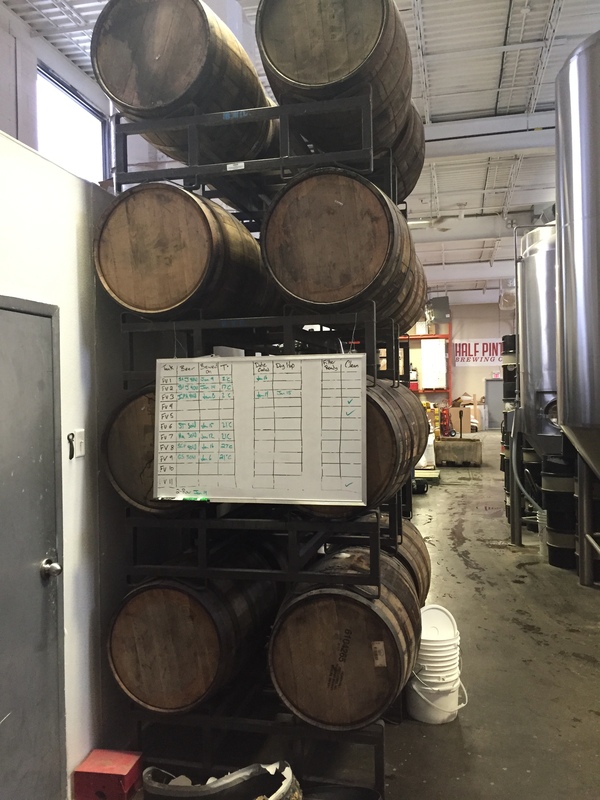 While working as a brewer assistant at Half-Pints, Jeremy also took on the task of conducting brewery tours. Half Pints already had a full slate of brewers and while Jeremy was happy to help and felt he was learning, he ultimately wanted to be brewing beer. This past summer, 2016, two of the brewers from Half Pints left to pursue other goals which left Half Pints with space for a new brewer. Dave Rudge, President of Half Pints, sat down and asked Jeremy about his goals. Jeremy said he wanted “To one-day be the best brewer in Winnipeg and to brew beer until I can’t brew anymore.” Dave offered him the chance to get trained on the brewing equipment and Jeremy has brewed full-time ever since. Jeremy loves all styles of beer but has a ton of respect for the old-world breweries. He has a Czech background himself and deeply respects the skill required to brew and the history behind old world beers. He takes great joy in drinking beers from North American breweries as well of course. Jeremy said that he feels breweries are moving away from the tendency to brew to style and are no starting to brew to inspiration. Instead of trying to replicate a style of beer they are trying to create a beer. While Jeremy didn’t really give me an answer on his favorite style, the first beer he has developed and brewed at Half Pints is a California Common. We can expect to see this on the test batch system before too long and Jeremy hopes the beer will be scaled up into a bigger batch. In the next 5 years, Jeremy sees himself strengthening his brewing skills, increasing his knowledge, and immersing himself in the burgeoning Winnipeg brew scene. For now, he’s brewing 40-50 hours a week and using this as an opportunity to begin dialing in and improving his skills. Jeremy is completely immersing himself in beer. I also took this opportunity to catch up on what’s new at Half Pints. The tap-room is up and running and looking darn fantastic. This has given Half Pints’ the opportunity to expand the use of their test batch system as they can put it on tap in the tap-room. This is something they are looking to do as often as possible, both to scale up and just for the fun of it. Some of the things in the taproom and will not be available anywhere else. What Jeremy was able to share is that we will be seeing a test batch of Ol’ Glory (American Barley Wine) and a Count Chocula Stout coming soon. As well there is a Winter Spiced Red Ale that will be on the growler bars around the city as well as 1000 litres of Humulus Ludicrous (Double IPA) that’ll be on draft and growler only. Throughout the year, we can expect to see a bunch of brand new beers and old favourites making their return. Given the tasting room, it’s given Half Pint’s the ability to have a beer with their customers and talk to them in a way they haven’t had the chance before. Aside from the test batches, Half Pints is also hoping to play around more with casks and pins to put twists on their beers for the tap-room. With the taproom, fully operation, I think it’s a good time to get into Half Pints and taking advantage of the tap-room. I’ve got a follow-up with Little Brown Jug still coming this week and it is almost time for my Marathon month of posting on the Craft Beer Advent Calendar. Check out last years’ wrap up. This year, it’s Old World Breweries, New World Beers. Exciting. Today’s review comes to us from a local brewery of which I am very proud to be able to support. I’ve talked about Half-Pints in the past so for more information about the brewery itself please read those here and here or check out their website here. The beer I am tasting from Half-Pints today is there highly rated Black IPA, Black Galaxy. A Black IPA is a specialty style of an IPA. Like an IPA, they are meant to be hop forward and drinkable. One of the biggest differences is that they bring a darker colour and often roasted or burnt flavours from the use of different malts. When drinking this style one can expect to get a lot of different hop notes from the variety of hops used in the brewing of the brewer that are melded with a variety of different malts that would not normally be used in the brewing of an IPA. This beer is a variation of the IPA style and was first commercially produced by Greg Noonan as Blackwatch IPA around 1990. It began to grow in popularity through the 2000s and there are many varieties of this style which can be found. This beer is also known as a Cascadian Dark Ale. Overall the style is similar in many respects to a traditional IPA but bringing with it some more complexity in the malt profile to compete with the diversity of hops. Appearance: Black with a slight red hue when held up to the light. A persistent 2 finger off-white head that leaves lacing as it dissipates. Smell: Piney notes, citrus, passion fruit, roasted malt. Soft notes of pineapple and coffee also. Mouth feel: Medium body, medium carbonation that leaves a bit of tingle on the tongue. Taste: Passion fruit and pineapple come through on the taste with a nice bitter finish that balances well with the sweet fruit, light caramel, and roasted dark malt backbone. Overall: I haven’t had many Black IPAs to compare this too but overall this is a great beer. It is well balanced and brings a depth of different flavours (passion fruit, pineapple, caramel, coffee, roasted malt) that all seem to balance well together and with the 60 IBUs. Do I like it: Yes. This is a beer that I really enjoy. Half Pints does a great job with this beer bringing both balance of malt and hop. The flavours in this are really good together and I’d be happy to drink this any day of the week. I had the opportunity to visit Half Pints and speak with the president and head brewer David Rudge. 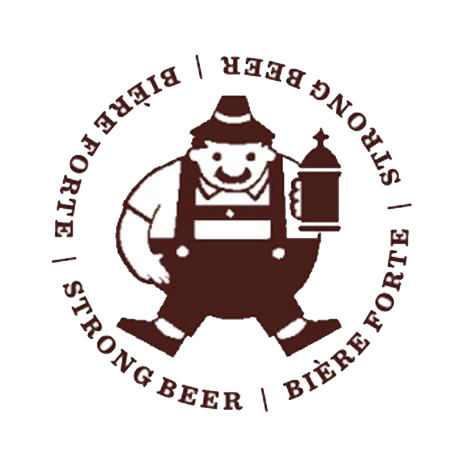 I had been curious about the brewery itself, their plans for this upcoming year as well as how the growler bar and his appointment to the provincial “Craft Breweries Initiative” were going. He was kind enough to give me his time and for the entire visit I did not feel rushed or as if he had somewhere else to be – quite nice from someone who has grown such a successful brewery, not what I expected. 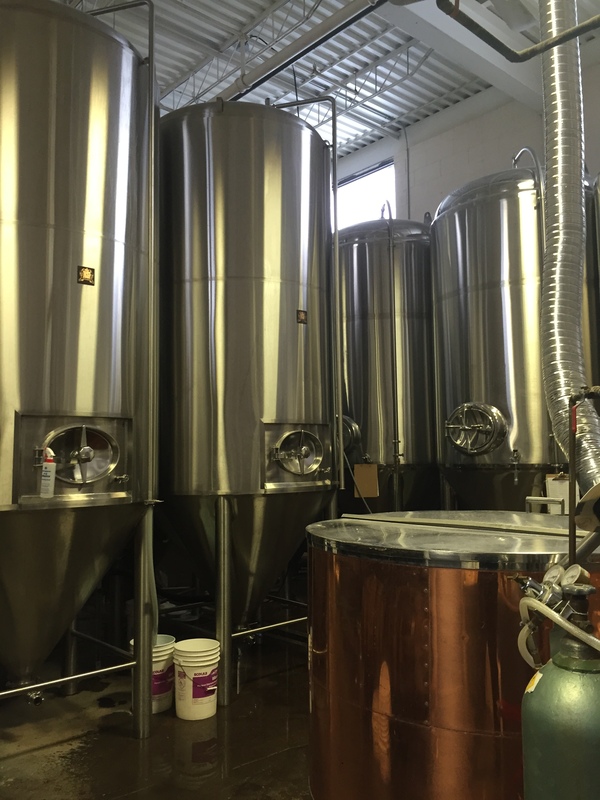 Image of the brewing room at Half Pints. Casks are available at the Grove Pub! I have already given a rundown of the history of Half Pints in my review of the Doc Emmett Brown Ale. I won’t go over all that again. Rather, I was able to learn about where the brewery stands today. At present Half Pints has a brewing capacity of about 6,000 Hectalitres. They have a number of fermenting drums and numerous storage ones as well and are able to produce a variety of beers at any given time. Typically their 4 main beers on the go (Little Scrapper, Bulldog Amber, St. James Pale Ale, and Stir Stick Stout.) As well, they tend to have at least one seasonal in progress with another in the pipe to come up shortly. On top of that, their growler brews for the growler bar and any test batches that they may be working on could be bubbling away. All in all there are around 8 or 9 different beers on the go in the brewery at any given time. This year David told me he plans to switch things up a bit. He doesn’t like doing the same thing over and over again and so this year of the 15 beers that will be produced, 9 will be new beers. He wants to bring back some of the beers they brewed in their first year (2007) as well as some new ones. Half Pints is made up of 12 full time staff members who do a variety of tasks from brewing to filling/bottling to repairs and technical work on the equipment. David told me their bottling technician had souped up their Meenans bottler to be not only fill industry standard bottles, but also to be able to fill the 650ml bottles they use for seasonal beers. What’s really interesting about their staffing is that in the summer, David will hire a brewing student. The only requirement is that the student be a Manitoban. It’s a move that’s really important to David and something he has been doing for a while. In fact, one of the brewers at Half Pints is a former student who was introduced to the brewery in this way. David told me that you “don’t go to school to learn what to do right, you go to school to learn what to do when everything goes wrong”. Giving people the opportunity to work alongside experienced brewers is a great way to build capacity and allow for internal creative growth. He told me the crew at Half Pints are like a family. I can see from his supportive attitude where this stems from. One of the main reasons I wanted to sit down with David was because of the introduction of growler bars to Manitoba. I wanted to find out what sort of impact this had on his ability to be creative with the beers they brew and what overarching impact he felt it might have on brewing in Manitoba. 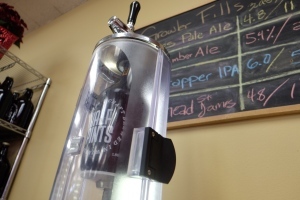 The implementation of the growler bars has allowed for a different group of people to access the beers from Half Pints. He told me “It’s a different set of people” who seem to be coming in for the growlers. It’s giving Half Pints the opportunity to hit a different market than they would hit with their bottled beer. What David had noticed was that there are a lot of younger people coming in to buy growlers. It is likely a university and young professional crowd who are seeking to get a better bang for their craft beer buck. The growler bars have also seemed to have had an impact on distribution. Since the opening of the growler bars, Half Pints has pulled a lot of its export back. They recently stopped shipping beer to Alberta which, according to David, was a big deal given they had been shipping beer there quite a while. What was interesting was that the decision wasn’t due to lack of popularity but more due to the fact they don’t have enough extra beer to send. Along with this ability to reach a different customer group, the growler bars have also allowed Half Pints to venture into more creative territory. “Before, we would have to be ordering labels 6 months in advance for beers.” Now, beers do not need to be labelled if they will be sold at growler bars. Instead, Half Pints just needs to indicate the value of the ingredients to MLCC and then, using a formula, MLCC gives them the price at which they need to sell the beer. This allows for them to come up with new beer ideas on the fly and gives the opportunity to really let the creative juices flow. I asked David whether they would be doing things like Test Batch Tuesday or experimenting with beers if the growler bars did not exist. His response was a resounding “No.” This creativity is really important to David and the Half Pints crew. He told me he doesn’t really understand why some breweries will see a beer made somewhere else and try to emulate it. He thinks that the creativity of a brewery and the ability to come up with their own ideas is really important. So, what about Test Batch Tuesdays? For those who don’t know, this year Half Pints has started a more regular test batch tasting opportunity. Tuesday mornings a 50L keg (about 25 growlers) will be tapped. Inside it will contain a test recipe a staff member wanted to try out. They tweet out when they tap the keg, so if this interests you make sure to follow @halfpintsbrewco and @halfpintsbrucru on twitter. The idea came from just wanting to try out different things. Using 50L batches they will either use a Magic Brew System to brew something totally unique from scratch or pull some of an existing beer out during different stages of brewing so they can experiment with it. The idea behind this is not only to give some creative freedom to the brewers but also to actually test out different recipes to see if they might want to take it further to a larger batch in the future to sell at the growler bars or perhaps even bottle. They started out doing these on Saturdays but ended up with too many people lining up for a taste and being disappointed when the batch ran out. The shift was made to Tuesday morning’s but a similar issue has arisen. I asked David if he might try alternating times and he said that in the future they might look at shifting the times to allow for different groups of people to get out and grab some of the test brew. What was nice to hear is the test batch might not be the last chance to try the beer. It might show up in a larger batch in the future. The amount of respect and trust David has for the crew at Half Pints is really admirable. He has really let them go with the creative aspect and opened the door to trying new things. He told me that when Half Pints opened, the expectations for beer was so low people were fine with the status quo. Since opening and pushing the creative boundaries, other breweries in the MB market are needing to step up their game and start considering some creative options. I think we can really see this in action with Fort Garry starting to expand outside their main brews. As well as all the work that David does at Half Pints to keep the beer flowing, he has also recently been appointed to the Manitoba Governments Craft Breweries Strategy. As the only brewer on the committee he brings a really unique perspective to the table. We had a really good conversation around the recent changes to the laws here in Manitoba and how it has opened the doors for new breweries to start up. In fact, David was one of the people who fought with the MLCC to allow for growlers to be sold. He didn’t do this just so that he could benefit from them but also so the next person in Manitoba who opens up a brewery doesn’t have to be beholden to bars and contracts for selling beer. With the laws as they stand today, a small guy could open a brewery tomorrow and not have to worry about bottling, canning, or selling his beer to bars. He can sell 100% of his beer to growler bars and still be profitable. He told me the amount of equipment and labour required to run a small brewery requires about 2 people and that given the laws today it can still be profitable. David hopes in the near future the laws can be further expanded to allow for taprooms to be opened in Manitoba. For those who don’t know, taprooms would allow for pints of beer to be sold in the same location as growlers. This would allow for small breweries to essentially sell 100% of their beer at the brewery and not be reliant on any other party for the sale of their beer. According to David this opportunity for growth is necessary to the survival of the local craft beer industry. I was curious whether David was concerned about the creation of competition within the province. His response really told me a lot about his character: he doesn’t consider it competition. He doesn’t even consider Fort Garry competition. If he had the choice between getting Fort Garry’s tap at a bar or no tap at all, he’d prefer no tap. He wants to be taking Molson’s tap or Labatt’s tap and wants to see local craft beer grow and prosper. Given the growth in demand for craft beer and the government’s willingness to support and grow the industry, I can see this type of shift happening. Will they ever go to Investor’s Group Field or the MTS centre? I asked David and he told me that it likely won’t happen in the near future. Labatt’s and Bud sign contracts with these venues and typically take a hit on cost so that they can advertise at the games. Given the fact people are willing to pay $9 a beer, he doesn’t think there will be any quick movement on behalf of these venues to swap out brews. Overall, I’m really excited about the conversation I had with David. Not only is he a really down to earth guy who loves beer, he has some really solid ideas and a really good plan for the next year. I’m excited to see what he and the folks at Half Pints come up with this next year and I am going to do my darndest to try as much of the new brew they put out. 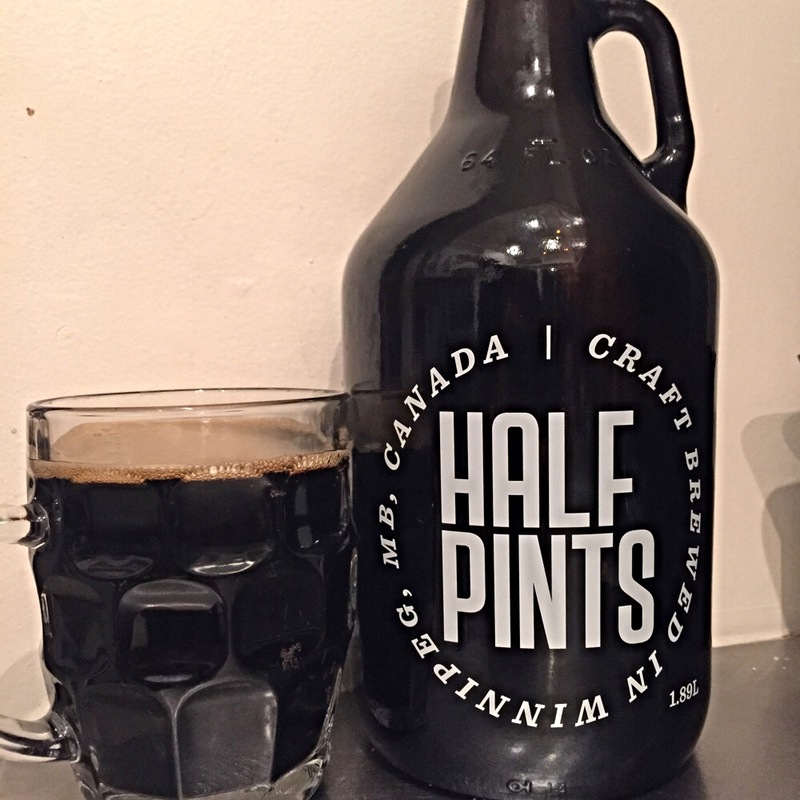 Overall, Half Pints is a brewery that makes buying beer in Manitoba not just about the quality but also about the people who brew it. I for one am proud to support Manitoba craft beer.